On Sunday my scripture was from Matthew 28:19. Jesus was giving the great commission to the disciples- GO!!! I love Jesus and want to please him in all that I do. Painting is great therapy and it helps me hear God clearer. I often wonder why he picked me-do you ever wonder those things? Well, it’s natural to wonder-just don’t wander. Anyway-not much to say tonight- just wanted to share the painting. One day I will be in the water baptizing people-it is the desire of my heart. I don’t know- maybe this is me-maybe it is you-who knows? All I know is that I loved doing it. 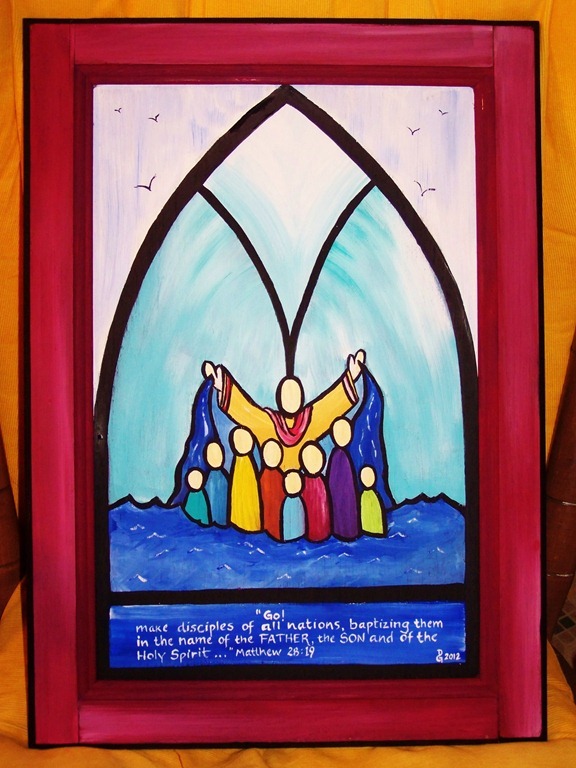 The colors represent every nation and tribe and they are standing in the waters of baptism-sprinkled or immersed-it matters not. The Holy Spirit is over the entire scene and it gives me great peace and much hope. I hope it does you too.